Referring to the accelerating accumulation of digital data, German Chancellor Angela Merkel said: "This digital world has to be given a legal framework, an underlying order. We're only at the beginning of that. National laws alone will not suffice." Restricting the accumulation of data may no longer be the right approach, however, warned Dieter Kempf, president of the German Association for Information Technology, Telecommunications and New Media (Bitkom). "We have to wonder whether the approach to data protection that strives to limit collection of personal data can apply in the digital world," he said. "Categorical nay-saying may be popular but it doesn't do justice to the digital approach." Those who want to use our personal data must protect it, Kempf said, suggesting we use more IT to help solve the privacy problem that IT has created. "With the aid of anonymization, pseudonymization, privacy by design, organizational measures and new technologies such as homomorphic encryption it will be possible to boost data protection to exceptionally high levels," he said. Stephan Weil, Minister-President for the German State of Lower Saxony in which Hanover lies, also evoked the "ethical and moral dimensions of data privacy and data protection." In the European Union, he said, "We soon need to have standard rules so that everywhere we have a high level of data privacy. In free trade talks with the U.S., our European standards have to be the benchmark." Even Martin Winterkorn, CEO of Volkswagen, expressed concern that today's computerized, connected cars could become a threat to their drivers' data privacy. "We protect our customers against all sorts of risks and dangers on the road -- losing control and aquaplaning, nodding off at the wheel, getting stuck in traffic jams. We need to be equally responsible about protecting our customers against the misuse of their personal data," he said. However, he rejected the notions of the "nanny state and Big Brother." To avoid intrusive monitoring of drivers -- and intrusive government regulation -- he called on auto manufacturers to come up with common standards on data privacy: "What is needed here is a form of self-regulation by the car industry. Volkswagen, certainly, stands ready to sign up to such an arrangement." Only U.K. Prime Minister David Cameron seemed determined not to mention the war on privacy. With his first remarks, he gave an impression of someone remote from the concerns of typical Europeans today. The ceremony had opened with a dialog between a young actor and a robot, RoboThespian, followed a little later with a performance by violinist Nicky Benedetti, prompting him to observe, apparently without irony, "What can I say? Violins, music, a robot thespian: This for me is a typical Sunday evening." He went on to recap initiatives introduced or planned by his government to favor innovation, including the "patent box," which reduces taxes on profits from patented inventions made in the U.K., and new grants to companies developing products for the Internet of Things. And on Monday Ofcom, the independent regulator and competition authority for the U.K. communications industries, will introduce new proposals to make spectrum available for connected devices and other new applications, he said. Evoking chip companies such as Imagination Technologies, creator of the graphics chips Apple uses in the iPhone, and Arm, designer of the ubiquitous processor cores found in most mobile phones, he said his mission was to promote U.K. innovation. To that end, he called for a new alliance between innovative British companies and German manufacturing expertise, concluding: "Let us join forces, let us make progress through technology, and let us, Britain and Germany, do it together." While Cameron seemed content to leave British wealth creation in the hands of a privileged and well educated few innovators, Merkel concerned herself with the wider job market, reminding the audience that humans are still needed to interpret the data pouring out of connected devices. "The human being may not be quite so superfluous as it would seem listening to previous speakers," she said. "The IT sector offers an enormous opportunity for all member states to develop modern forms of employment. There's a lack of skills which is why education and training is so important." The ceremony ended with a demonstration of Volkswagen's vision for the interior of the car of tomorrow. Bitkom's Kempf had earlier suggested that we are about to experience another redefinition of human-computer interfaces, and Winterkorn brought on stage a prototype of how that might look. 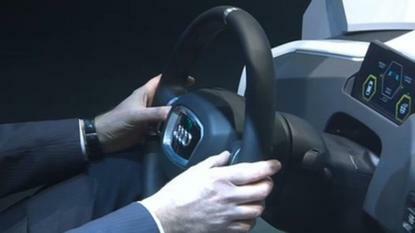 The prototype, James 2025, illustrated how, while travelling on a smart highway able to transmit traffic and environmental conditions to the vehicles on it, drivers might hand over control to their car by simultaneously pushing two buttons on the steering wheel before sitting back to enjoy the ride and perhaps take part in a high-speed video conference. With Cameron and Merkel declining to climb aboard the prototype, it was left to Weil to show how technology may yet, in some situations, make humans superfluous.